It’s the thirteenth of the month again—a long two-and-half weeks until Halloween, but time to lift the lid on the month’s worth of stories that have accumulated in our “Favorites” folder since the last installment of FirstNerve’s most repellant feature. In Geneva, Wisconsin, business owners complained to police about “a foul odor” coming from a neighboring building. You know what that means—and so do the cops. They entered the building on Kruger Road with the expectation that “the rancid odor was a rotting dead body.” (Read ISDP much, officers?) Instead, what they discovered was “an elaborate growing operation” for hallucinogenic mushrooms. 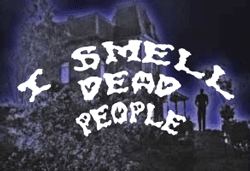 In the annals of ISDP it is often an alert citizen who notices an unusually disagreeable odor and reports it to police, who find the deceased. This was the case last month in Edwards, Mississippi. But the citizen in question deserves a special shout-out. Clinton Police Chief Don Byington said the body was found after a farmer off Highway 22, near Edwards, noticed an odor when he went to tend his hogs at about 6:45 p.m. on Friday. The guy works on a pig farm but can still pick up the scent of human decay? We say bravo. The deceased was an 81-year-old woman; an autopsy determined that the cause of death was blunt-force trauma to the head and neck. A 39-year-old man has been charged in her murder as well as that of his 68-year-old aunt in Alabama. Tenants of an apartment building in Brookline, Massachusetts, began complaining to the landlord about an “odor on the fifth floor.” When building management was unable to contact the owner of the smelly unit, where a week’s worth of mail was piled up, they forced their way in along with police. The body of the 28-year-old female resident was found inside. Foul play was not suspected. Down near the Indian River Lagoon in Melbourne, Florida, residents had been smelling “a foul odor.” They called police, who searched the area but found nothing. A few days later a local fellow found the body of an unidentified adult male among the mangroves on the lakeshore. Finally, we close as we opened: with an incident that strictly speaking does not qualify as an ISDP event. Call it a pre-odorized demise. It happened in Florida on October 1. A 48-year-old Orlando man apparently committed suicide Friday morning using a poisonous gas inside his car while parked at an Interstate 95 rest stop in Fort Pierce. Just before 6 AM, a Florida Highway Patrol trooper found a car reported as suspicious because of a sign warning “Do not approach — hydrogen sulfide.” A foul odor was in the air around the car. The rest stop was closed while an investigation got under way. The deceased appears to have used common household chemicals to produce a fatal concentration of the rotten-egg-scented vapors, a method recently popularized in Japan. Endanger innocent people and emergency workers on your way out? Nice work, pal. That last one makes me wonder what happened to the good ol' 'letting your car engine run'-method. Carbon monoxide: deadly and odorless. Hmmm . . . Maybe it's time to launch FirstNerve's line of Jack Kevorkian automobile air fresheners. Heavenly Hemlock: "The top note's a killer!" Patchouli & Purgatory: "Relax while you linger!" Big Sleep Bouquet: "The drydown lasts forever!"